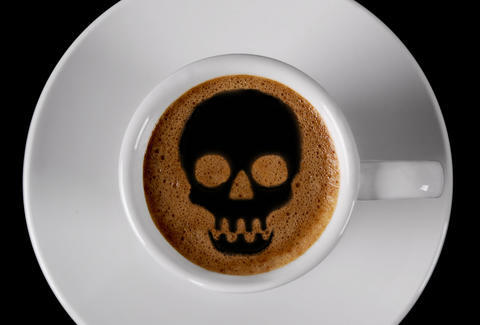 Even if you guzzle an entire pot of coffee in a morning, you won't come close to the amount of caffeine it'd take to overdose, let alone die. An insanely strong brew available in Australia, however, will get you pretty damn close. Oh, and it'll keep you awake for up to 18 hours. The potentially dangerous iced coffee, fittingly called the "Asskicker," was recently created by the maniacs over at Viscous Coffee in Adelaide, Australia, according to a report by The Advertiser. One serving of the stuff contains five entire grams of caffeine, which is more than 12 times 400mg daily limit recommended by the Food and Drug Administration (FDA) for healthy adults and more than 75 times the amount of caffeine in a shot of espresso. For additional perspective, that's about half the amount experts believe could be lethal. Damn. But as Viscous Coffee Owner Steve Benington told the paper, the jet fuel-like beverage is meant to be slowly consumed over the course of three to four hours, resulting in 12 to 18 hours or being completely wired. In other words, you'll be hopped up and flying at 100mph like Kramer after a few caffe lattes. Benington said he created the concoction for an ER nurse who needed to stay awake for an unexpected overnight shift and, well, let's just say it did the job. After sipping it over the course of two days, the nurse ended up staying awake for nearly three days. In case you're wondering, a single cup of Asskicker is made by combining four shots of espresso, four 48-hour cold brew coffee ice cubes, 120ml of super-strong 10-day cold brew coffee, which is finished with four additional 48-hour cold brew ice cubes, per the report. Sure, it doesn't sound like the stuff tastes very good, but let's just say the bitter flavor will probably be the least of your worries. Tony Merevick is Cities News Editor at Thrillist and even a regular cup of coffee can give him the shakes or sweats sometimes. Send news tips to news@thrillist.com and follow him on Twitter @tonymerevick.